Creative alchemy is the art of combining your skills and talents to create something unique. I know plenty of creatives that aren’t just good at one thing. Some who play music also paint. Some designers are also sculptors. And, still others engage in just about every artistic discipline imaginable. Entrepreneurs can’t help but connect the dots between seemingly desperate entities and see the possibilities. If you’re a musician that also likes to paint, then there’s almost certainly a way of bringing the two mediums together. For instance, you could host a CD release party/art exhibition hybrid event. We see this in the niche business world as well. Consider the example of Nerd Fitness, which is a nerd-friendly fitness website with gamification elements that make the process of getting in shape more fun. So, it’s a hybrid community for nerds who also want to feel and look their best. If you don’t consider yourself multitalented, or you’d prefer to dedicate yourself to a single artform, that’s fine. Creative Alchemy may not be for you. But if you’re beginning to see some possibilities emerging, read on. Emilie Wapnik is the founder and creative director of Puttlylike. Her website is a community dedicated to a group of people she calls “multipotentialites”. As I’ve already shared, there are creative and artistic people who are good at a lot of different things. Wapnik is one of those individuals and she encourages her tribe to pursue every passion they have, without compromise. Now, let’s be realistic here — you need to go about this in a structured way. If you don’t, you’re not going to get anything done. This might mean choosing what project to focus on right now, maybe for a 30- to 90-day timeframe, while you forsake all other interests. Or, maybe you could triage projects and work on the top two or three that you find most compelling. And, as you finish one, perhaps you could bring another in. If you visit Wapnik’s website and read a few of her blog posts, you’ll certainly get some ideas on how to develop that type of structure around your projects. I don’t think Creative Alchemy is a license to pursue everything you want to do simultaneously. It’s the discipline to take massive action on what you want to do now so that you can free up your time to engage in the next thing you want to do later, and then the next. 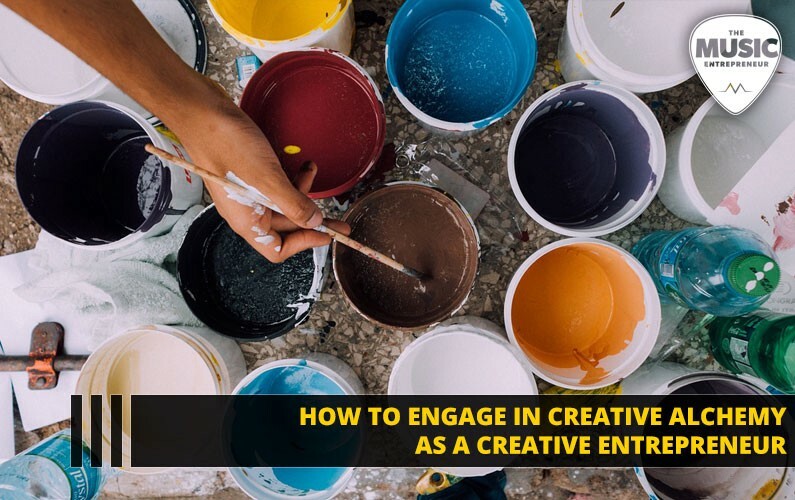 But if Creative Alchemy is something that has captured your imagination, then recognize that there is a way to try your hand at every artistic medium that intrigues you. And, ultimately, it’s the practice of combining these passions in meaningful ways. But to do this right, you will need to be a both/and thinker instead of an either/or thinker. Another Creative Alchemist I’ve had the pleasure of talking with is Jules Schroeder, Founder & Visionary of Unconventional Life. She was a guest on my podcast and I was a guest on hers. If you visit her personal website, you will quickly see that her interests and passions range from music and public speaking to travel and Acro dance, and a great deal more. And, her visitors have even told her that her website is a little all over the place. But Jules’ story is positively inspiring. In 2015, she got into a wakeboarding accident that left her paralyzed in her neck. Apparently, she was visited by a white figure and six black shadow council members in her hospital bed. She was then told that she had more work to do in the world and was asked whether she wanted to continue. Unwilling to go on paralyzed, her neck miraculously forged together, and she got a second lease on life. So, she made a vow to make the most of her time here. No wonder she’s so motivated and action-oriented, right? I like the idea of “living like there’s no tomorrow”, because in a very real sense, today is all there is. Yesterday is a memory. Tomorrow will just be another today. So, it’s all about what you make of the now. And, now is now. If you had no constraints in your life — temporal, financial, physical, mental, emotional, psychological or otherwise — what would you do? What would you pursue? What would your life look like? People let a variety of things stop them from experiencing and engaging in life, and it ranges from a “sore leg” all the way to a debilitating health condition. You can’t move ahead by “coping” with this. You can only move ahead by clearing this clutter and making space for the new. I’m not making light of any disadvantages, any challenges, any problems or issues you may have. But just know that many have let those things stop them from pursuing their dreams. Will you? This book is not about me. It’s about you. I was somewhat reluctant in profiling myself in this section of the book. But as a purveyor of Creative Alchemy, I felt it was my responsibility to share. I don’t have a shortage of ideas when it comes to combining my skills and talents in compelling and unique ways. As my bio says, I’m a musician, studio engineer, author and content creator, designer, teacher, speaker, coach, entrepreneur, investor and community builder. And that’s the short list! I’ll give you one example of where many of my talents could all come together: video. For instance, I could utilize my art, my graphics, my music and my voice to create unique video content. It would be a lot of work, because it’s the meeting place of several disciplines. But if I brought it all together, I know I could create something unique. In my experience, this is not something you would ever be able do inside of a job. That’s partly what makes it so counterintuitive. But there are many aspects to creative entrepreneurship that are counterintuitive. So, don’t fight against it. Embrace the tension. That’s where the growth happens. I will never discount the importance of focus. But just because you’re focused on one thing doesn’t mean you can’t be focused on many things. Meanwhile, focusing on many things at once is a challenge. And, you would need to manage your schedule extraordinarily well to do it all at once. Even then, you’re going to risk burnout. But as a mentor of mine once explained, we can all handle about two or three things simultaneously. So, don’t overload yourself. Decide what matters most to you and pursue that. Choose two or three things and take massive action on those. And, when it comes to Creative Alchemy, you’re allowed to combine several mediums. Yes, it will be more work. You will need to allow for more time to complete each project you work on. But you can also captivate the world by fusing different disciplines together. That’s what’s cool about it. Originally published at www.musicentrepreneurhq.com on December 26, 2018.